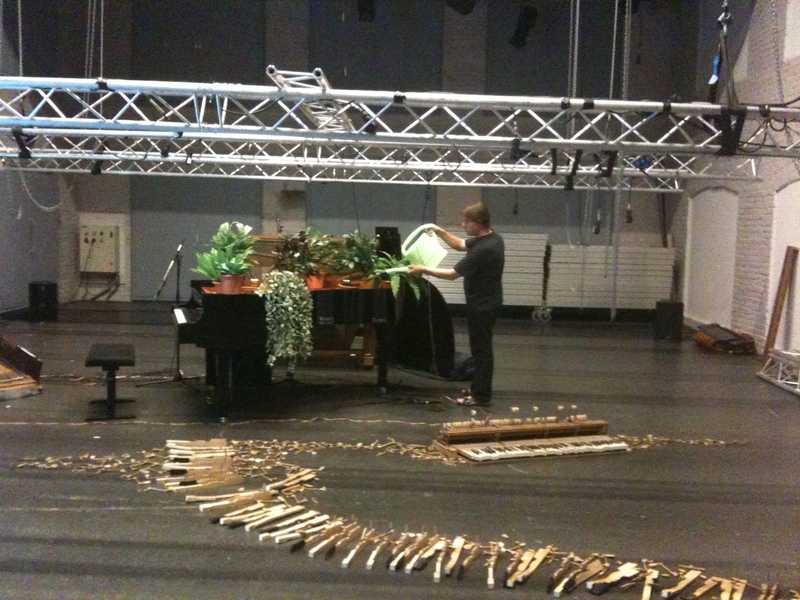 Pièce d’Ameublement (2011) for grand piano, plants and live electronics. 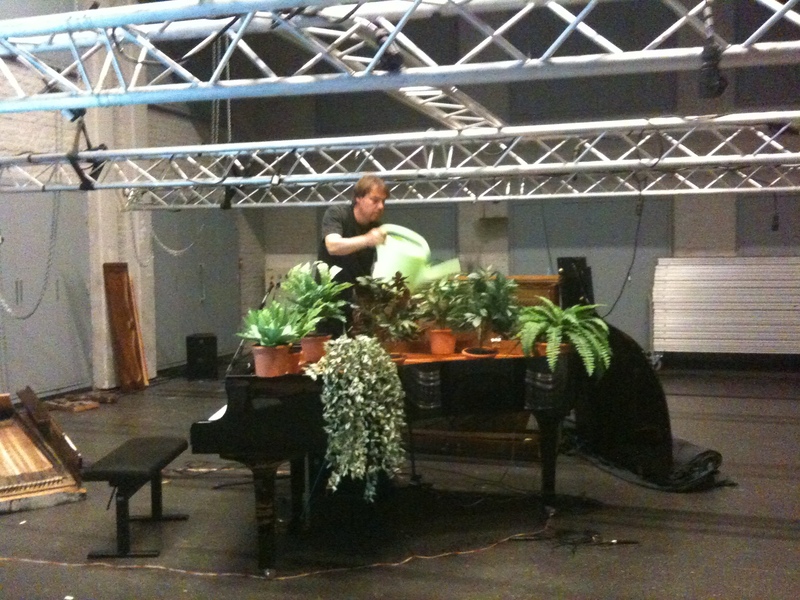 The plants on the piano are watered by the pianist. This piece is based on the idea of pianos functioning as furniture in many living rooms. The piece should be performed in between the pieces of a piano recital. During the recital, the pianist sometimes places (plastic) plants on the piano. At a certain moment (preferably after a very virtuosic piece), he or she starts to clean the piano. Starting with an everyday attitude, slowly the cleaning transforms into a more stylised form of movement. The movements of the sponge become audible as well, and whilst they will sound like cleaning sounds in the beginning, pretty soon they sound more like a weird piano. A small microphone in the sponge picks up the sounds of cleaning the piano. The computer transforms this signal and the result is emitted through a loudspeaker placed underneath the soundboard of the piano, so all sounds will be coloured by the resonance of the piano. The set-up for Pièce d’Ameublement. 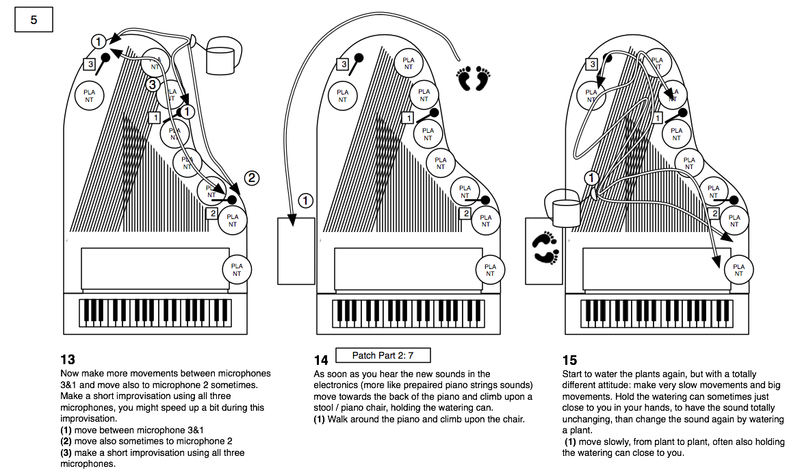 The gesture of the pianist is sounding through the piano, but instead of conventional piano playing gestures, the performer is making “cleaning gestures” and will therefore normally be identified as not making music. By aestheticising these movements, the performer becomes a musician as well, now playing the piano with cleaning movements. A page from the score for Pièce d’Ameublement. 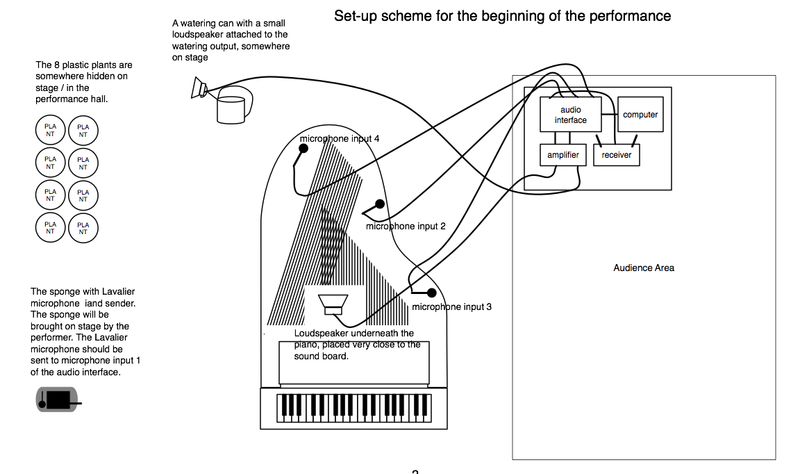 This piece actually uses microphone and loudspeaker technology mainly for triggering sounds (the watering can part) or live electronic processing (the cleaning part). Microphones and loudspeakers, besides their functions directly relating to sound, function as a kind of sensor, similar to how they are used in tubes by Paul Craenen and Open Air Bach by Lara Stanic. The microphone in the middle of the grand piano triggers notes of medium pitch and one or two at a time.